Fifteen days after the album was released, it reached number one, and in 2000 recieved the Diamond award. The feud between East and West Coast hip-hop artists in the 90s left the hip-hop community without two of their best artists, Tupac Shakur and Christopher Wallace. Wallace was better known as The Notorious B.I.G. or Biggie Smalls. Fifteen days after being shot and killed outside of a Vibe magazine after party in Los Angeles, Biggie’s second studio album was released. Ironically, the rapper named his album Life After Death. Biggie was exposed to a criminal lifestyle at a young age. At twelve years old, Biggie began dealing drugs in his hometown Clinton Hill, a neighborhood in Brooklyn. His mother worked two jobs while raising him after his father left the family when Biggie was only two years old. People from Clinton Hill remember Biggie as a local drug dealer and never thought he would make something out of the raps that he would perform on the streets for fun. Although Biggie was reported to have excelled in school, he dropped out at seventeen. In the next two years he would have multiple run-ins with the law for crimes such as weapon charges and dealing crack cocaine. After spending nine months in jail for his charges, Biggie created a demo tape that would begin his trek to stardom. Biggie’s demo was heard by The Source’s editor which led to him being featured in their Unsigned Hype column. This column was dedicated to up-and-coming rappers and they gave Biggie’s demo a positive review. Uptown Records record producer Sean Combs got his hands on a copy of the demo and after meeting Biggie, signed him immediately. Combs was fired by Uptown Records shortly after Biggie’s signing and he created his own label, Bad Boy Records. Biggie followed Combs and signed onto Bad Boy Records where he would release his debut album, Ready to Die, on Sept. 13, 1994. In 1994, Shakur was shot and robbed in the lobby of a New York recording studio. After surviving the ambush, Shakur placed the blame on Combs and Biggie which just added more fuel to the fire. Biggie’s debut album’s success took attention away from West Coast hip-hop and this caused more negative tension between Bad Boy Records and the West Coast’s Death Row Records. Shakur signing onto Death Row Records made matters even worse. Recording for Life After Death began in September 1995 and would take about 18 months after experiencing multiple interruptions. Biggie was arrested twice in 1996 for harassment and drugs and weapons charges, and once in 1997 for an assault charge. Shakur also died in 1996, after being shot multiple times in Las Vegas. Biggie was immediately linked to the death but was recording in New York at the time of the shooting. 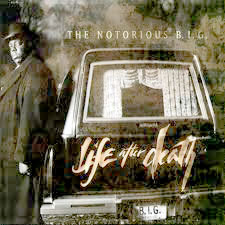 Life After Death is the perfect follow up to Biggie’s debut album. Ready to Die tells of Biggie’s experiences on the streets and living the life of a drug dealer, while Life After Death eerily depicts what life was like now that he had made it big and how real of a threat death was at the time. This double-disc album contains 24 tracks and has a running time of an hour and nine minutes. This album features collaborations with artists like R. Kelly, Run-DMC, Lil’ Kim, Jay-Z and many more. The first song “Life After Death (Intro)” begins uncannily with gunshots and the sound of an ambulance. Combs is featured on this introduction with a goodbye to Biggie and it makes you wonder if they recorded this before or after Biggie’s death. Throughout the 24 tracks, it is easy to choose which songs could have been left out because it is apparent how much better they are than others. “Kick in the door,” “Long Kiss Goodnight,” “Notorious Thugs,” “My Downfall,” “What’s Beef,” and “You’re Nobody (Till Somebody Kills You)” are all tracks that contain disses and references to Biggie’s rivals. Throughout the album, Biggie used subliminal phrases to attack his enemies. Biggie used this album to tell the movielike stories that he encountered on his trip to the top. There is an obvious change in style in Biggie’s raps as he balanced between gangsta and mafioso rap while crossing into mainstream music. It is said that Biggie is responsible for this evolution considering he was one of the first rappers to make gangsta rap more radio-friendly. “Hypnotize,” “Goin’ Back to Cali” and “Mo Money Mo Problems” are instantly catchy tracks that make you want to hit the repeat button. Life After Death is considered one of the best posthumous albums released to date. It is considered the largest jump to number one on the Billboard 200 chart for jumping from number 176 to number one in just seven days. Life After Death is a groundbreaking album in hip-hop history. Since his death, Biggie has been honored by a variety of artists for his impact on the rap industry.